Freeporter Shea Wagner dives back to first as the ball careens toward Patriots basemen Cam Usher. 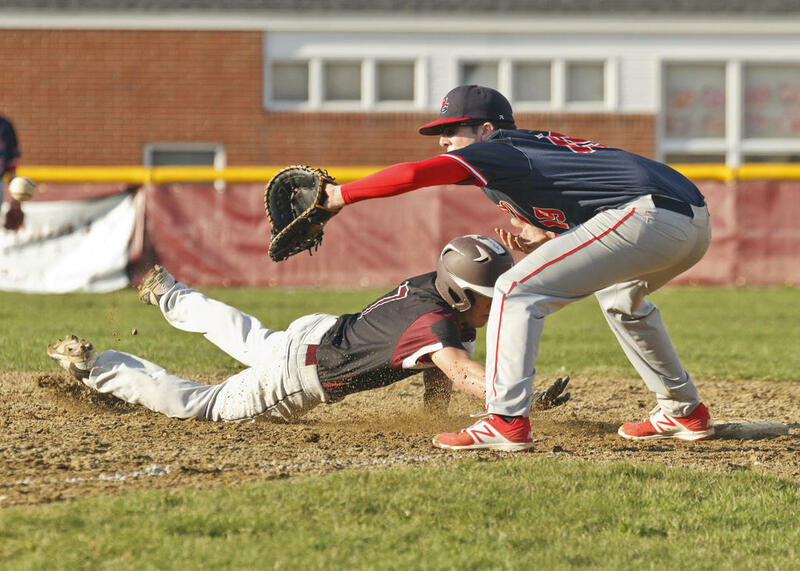 FREEPORT — Colby Wagner’s solo shot in the bottom of the first inched the Falcons out front of visiting G-NG on Friday afternoon, April 28, but the Patriots prevailed in the end, pulling ahead in the top of the eighth on a run by Nate Brindley. The bout would ultimately go G-NG’s way 3-1, bumping the team to 3-2 on the season while dropping Freeport to 1-2. The Patriots nearly got on the board first, in the top of the opening inning. John Henry Villanueva knocked a grounder single into center to spark the action, then rounded second and third when Nick McCann blasted a ball all the way to the fence. Villanueva, however, found himself stopped short at home, thrown out from a vast distance. Wagner, the Freeport catcher, turned the tag, staunchly blocking the plate. With two outs in the bottom of the first, Wagner showed the whole park how it’s properly done, getting hold of a ball – getting hold of it, and ejecting it full-throttle from the park, over the faraway centerfield fence. Whoosh. The middle innings passed scorelessly, tensely. Both teams played solid defense. Villanueva, on the mound for G-NG, and Josh Spaulding, on the mound for Freeport, worked the zone admirably – each gave up exactly one walk in the game, and neither did so until late – and behind them, their teammates fielded most contact with confidence. In the bottom of the fifth, Freeporter Max Heathco grounded into a 5-6-3 double play, a particularly impressive turn by the G-NG trio of Josiah Rottari (3B), Eli Winchester (SS) and Cam Usher (1B). Not until the downhill stretch did G-NG manage to get on the board, to seize a bit of momentum and begin to destabilize the tug-of-war. Will Shufelt took to the plate first for the Patriots in the top of the sixth and soon made contact, slicing a single just beyond the reach of Falcons first basemen Austin Langley. Damien Pye stepped in to pinch run for Shufelt; Pye reached second on an Eli Winchester bunt, then stole third. He dashed for home on a pass ball; Spaulding rushed forward from the mound to cover the plate, but Wagner’s hurried snap from the backstop sent the ball a bit high. Spaulding leapt for the catch, and Pye’s dive landed his fingers on the plate in the nick of time. 1-1. The action slipped into extra innings. G-NG struck first in that time, adding two in the top of the eighth. Brindley, pinch-running for Cam Andrews, scored the lead-taker after grabbing second on a pass ball during Usher’s at-bat, third when Usher bunted and home when Winchester likewise bunted. Langley, by then on the mound for Freeport, jumped forward to grab Winchester’s bunt; Langley pelted the ball toward Wagner at the plate, but the throw eluded Wagner, and Brindley tagged up for 2-1. Meanwhile, Winchester galloped all the way to second. Winchester reached third when Zach Mann flew out to center, and home when Villanueva lofted a double deep to left, just over the head of fielder Josh Burke. 3-1. Freeport turned in an admirable effort in the bottom of the eighth, getting two men on: Shea Wagner, who grounded toward short and reached first when Winchester bobbled the ball, and Max Doughty, who walked. Neither, however, would find their way home again, and the result went the Patriots’ way. “They got a lead-off walk,” Ridge said of the critical eighth inning. “A leadoff walk is going to be a cardinal sin for us. And they do a good job of situational hitting: They bunt a lot. Austin came in, and I didn’t think he threw bad – they didn’t hit him around – but they did the little things. Smith praised a handful of his boys by name. “We got another solid pitching performance by JV,” he said of Villanueva, who, despite throwing for all eight innings, totaled fewer than 100 pitches. “I look at Josiah Rottari at third base; he started that double-play. My two middle infielders, Eli Winchester and Zach Mann; first baseman, Cam Usher. The Patriots hosted Lake Region on Wednesday, May 3, and traveled to Waynflete on Friday the 5th. They visit Yarmouth on the 8th. Freeport traveled to Old Orchard Beach on Monday the 1st, hosted Falmouth two days later, and traveled to Wells two days after that. They visit Kennebunk on the 8th. Freeporter Josh Spaulding goes high and Patriot Damien Pye goes low on a play at home. Patriot John Henry Villanueva pitched all eight innings vs. Freeport – and kept his count below 100. A Freeport grounder slips past diving G-NG third-basemen Josiah Rottari; luckily, shortstop Eli Winchester is there to make the play. Patriots runner Jake Winchester dashes for first while Falcons baseman stretches out for the ball. Patriots basemen Zach Mann and Falcons runner Bennett Hight vie for dominance at second. Patriots second basemen Zach Mann unwinds into a throw to first.